Show your WordPress popup when user opens your site exactly by link, where in the end will be present this code – #ppsShowPopUp_100. Besides you can show popup on link follow with time delay. Check Popup plugin by Supsystic with “On Link Follow” option and delay for 5 seconds. 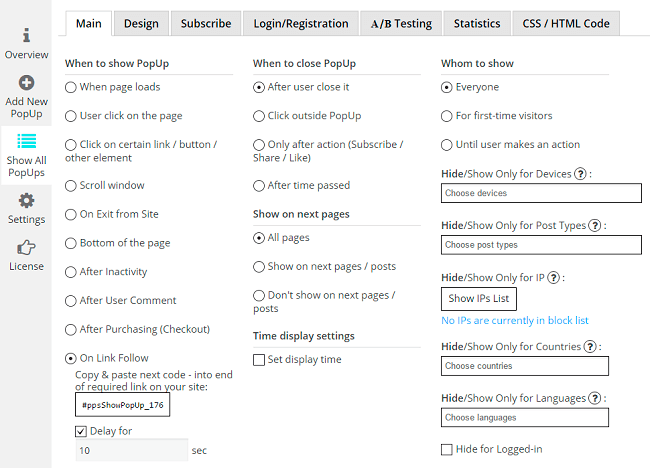 Enable “On Link Follow” option (*Pro Feature) in the When to show PopUp section on the main tab of Popup plugin and set “Delay for X seconds”. Another Popup configurations and triggers. WordPress popup plugin by Supsystic is one of the best WordPress popup plugins in the market. It offers the most bang for your buck considering the features and ease of use. We understand that you need a lot more than just a shiny popup. WordPress Popup by Supsystic offers you different kind of option forms, lead generation tools, statistics, A/B testing, and more. Try all the features of Popup by Supsystic, make your site more productive.